“FRAMINGHAM, Mass. — The gravesite of a Union Army major general sits largely forgotten in a small cemetery along the Massachusetts Turnpike. A piece of the coat worn by President Abraham Lincoln when he was assassinated rests quietly in a library attic in a Boston suburb. It’s shown upon request, a rare occurrence. 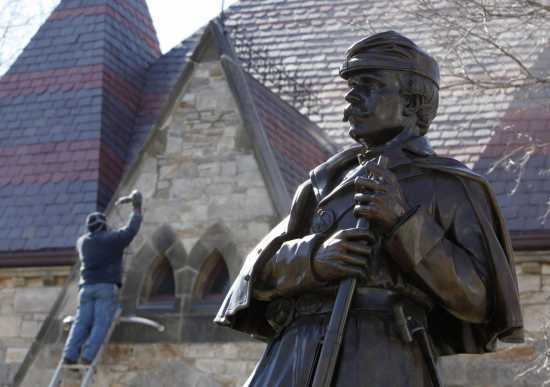 A monument honoring one of the first official Civil War black units stands in a busy intersection in front of the Massachusetts Statehouse, barely gaining notice from the hustle of tourists and workers who pass by each day. As the nation marks the 150th anniversary of the Civil War, states in the old South — the side that lost — are hosting elaborate re-enactments, intricate memorials, even formal galas highlighting the war’s persistent legacy in the region. But for many states in the North — the side that won — only scant, smaller events are planned in an area of the nation that helped sparked the conflict but now, historians say, struggles to acknowledge it. There are many interesting observations in this article. While the South is ridiculed as a whole with such stereo-types as being, poor, backward, stupid, etc. The North is portrayed as being progressive, morally superior and intelligent. To be sure, some Northern states have Civil War events planned and have formed commemoration commissions. Connecticut’s 150th Civil War Commemoration was set up in 2008 and has scheduled a number of events and exhibits until 2015. Vermont, the first state to outlaw slavery, started a similar commission last year to coordinate activities statewide and in towns. And some Massachusetts small not-for-profit and historic groups are trying to spark interest through research, planned tours and town events. But observers say those events pale in comparison to those in the South. To acknowledge the North’s issues with “racial inequality” before, during and after the Civil War, would be to knock down the pillars of the facade that the North went to war for racial equality. Acknowledgement of the North’s issues with “racial inequality” would lead to the acknowledgement that the Federal Government invaded the South to protect its flow of tax revenue from the South via import tariffs.